We are Cambridge Energy Data Lab, a smart energy startup based in Cambridge, UK. This blog, named "Cambridge Energy Data Analysis", aims to incrementally unveil our big data analysis and technologies to the world. We are a group of young geeks: computer scientists, data scientists, and serial entrepreneurs, having a passion for smart energy and sustainable world. Our Product Eneberg for PV Operators/ aggregators. Adding "Energy" and "Bloomberg" to evoke the image of an energy-trading software, we proudly present Eneberg as one of our core services. Eneberg is a web-based software for PV operators/aggregators to provide accurate predictions for the amount of electricity will sell to the wholesale market or their consumers (usually industrial or commercial customers). As savvy readers might know already, electricity supply and demand needs to balance at a 30 minute scale for stability in the most countries. Renewable energy generators have paid tremendous resources to forecast energy generation as accurately as possible in order to minimise “imbalance cost," which they are exposed to if they generate more or less electricity than their commitment.  As illustrated below, "Eneberg" is mainly focusing on "Aggregated Domestic PV," which makes the Eneberg unique in the market. Aggregated domestic electricity generations from rooftop PVs, which is still niche but is quickly growing, is our main focus, and having smart meters allows the generation data to be easily available. Prior to generation, an electricity provider must make a commitment to the amount of electricity they will supply. Deviations from this amount are penalized with an "imbalance cost," but the penalties are asymmetrical. If the generator produces too much, it will absorb the additional costs. If the generator produces too little, there are harsh regulatory penalties to pay. Therefore, forecasting accuracy should be conservative, underestimating the required electricity supply provisions to avoid paying the regulatory penalties. We provided this forecast for one of our major Japanese customers. The electricity market in Japan, called JPEX (Japan Electricity Power Exchange), has their imbalance mechanism represented by the blue line. Up to +3% over the supply requirement, JPEX will buy electricity at an agreed rate. Further generation, however, will be unpaid, so the profit will start to decrease after +3%. On the other hand, falling short of the supply requirement is heavily penalised, so profit will be more significantly damaged by not meeting the supply requirement. This demonstrates that the provider's commitment should be more conservative, and our calculated forecast, shown in the red distribution, reflects this. Our target is to minimise the imbalance cost by optimising the bidding strategies on the electricity wholesale market and improving forecasting algorithms. Our accuracy target is about 5% error, which yields about 90% of maximum profit. There are many challenges that lie ahead of us; such as quantifying the measures for uncertainty of human behaviour and weather forecasts for geospatially distributed households. In order to have reliable prediction with these uncertainties and without the large datasets of household electricity usage that our model will eventually use, we have adopted Bayesian approaches, some of which will be explained in this blog later. Electricity markets support green energy trading. Expect new solar energy markets across Mexico as this market matures. Emissions trading and TRCs are underway by major firms entering this international business market. Hello World. We are "Cambridge Energy Data Lab". Renewable energy in Europe: how far are we from the targets? Cambridge Energy Data Lab, ltd. . Simple theme. Powered by Blogger.